Throughout a woman's life her breasts are likely to change shape, size, and texture at different intervals. Unfortunately, these adjustments often come with pain or tenderness, which can vary in severity and duration. By learning about some of the causes of breast swelling and pain, you can become better equipped with regards to knowing when and if you can expect some discomfort. This should help you to prepare yourself and consider different management techniques and methods of pain relief should they be necessary. When a woman becomes pregnant the effects on her body are vast, and often uncomfortable. An early physical sign of pregnancy can be enlarged, swollen breasts. 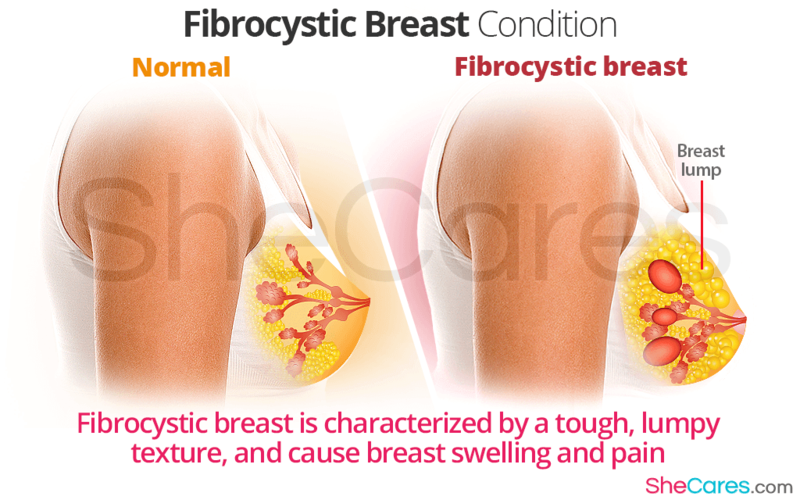 This is due to the hormonal changes that occur, and their effects on the tissue that comprise the breast. There is increased blood flow to the area, which can intensify sensitivity and sometimes cause pain and swelling in the breasts. Although once considered a disease, this affliction is so common that today it is widely acknowledged as an irritating condition that rarely warrants concern. Fibrocystic breasts can transpire at all different times during a woman's life, but they are most common in women aged between 20 and 50, or in those who administer hormone replacement therapy (HRT). It is thought to be caused by hormonal changes, which lead to changes in the cells and lobules of the breast, which can create a tough, lumpy texture. It is possible for this to create breast swelling and pain. The most common cause of breast pain and swelling is cyclical mastalgia. This refers to the uncomfortable sensation that corresponds with the menstrual cycle - usually affecting women between three and five days before their period. The hormonal implications at this time can make the breasts feel painful and sensitive, and possibly induce swelling. Some women find that only one breast is affected rather than both; if this is the case for you, it is worth noting that this is natural and you do not need to worry. Breast swelling and pain is unfortunately an uncomfortable and troublesome condition that the majority of women are likely to endure at some stage of life. While it is undoubtedly undesirable, there are measures that can be explored for helping you deal with the problem, and hopefully avoid any intense pain or difficulties.